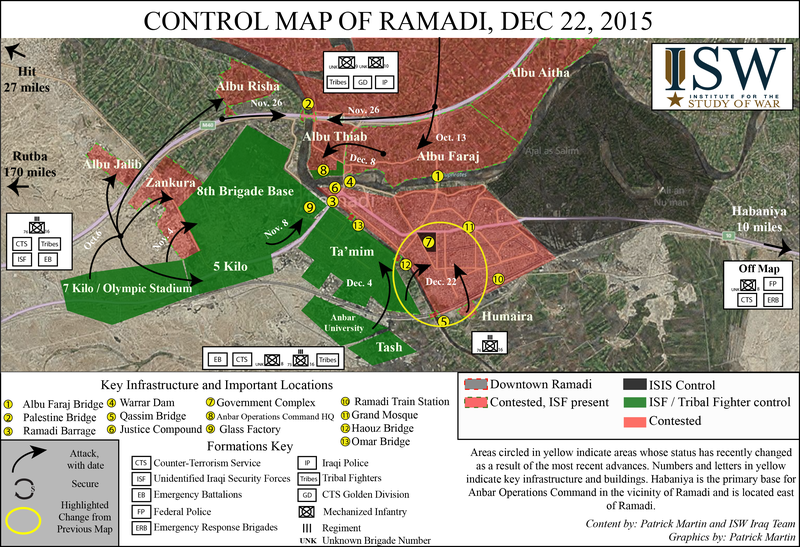 On December 22, Iraqi forces advanced into the center of the city of Ramadi, and headed towards the main government complex. The 3-pronged attack was launched from al-Tamim and al-Humaira Districts in the southwest and south, northwards into the central al-Hoz District, and the Andalus and al-Malab Districts further east. Iraqi forces had constructed a temporary bridge over the al-Warrar River, allowing them to cross over into the southern Hoz District, where they reportedly surprised the ISIL forces there. Two pairs of RAF Tornados and an RAF Reaper, provided the Iraqis with continuous close air support alongside other coalition aircraft. When ISIL fighters fired rocket-propelled grenades and small arms at Iraqi soldiers tending to wounded personnel, the Tornados intervened with a very accurate Paveway strike. The Reaper, meanwhile, assisted other Coalition aircraft in an attack that destroyed an anti-aircraft gun. Fighting continued the next day, while Iraqi reinforcements, including US-trained Sunni tribal fighters were sent to secure the recaptured parts of Ramadi, in order to allow the first wave of troops to continue pushing toward the government complex in the city centre. On December 23, 2 flights of RAF Tornado GR4s were contributing to the coalition air effort which supported the Iraqi army’s offensive into the centre of Ramadi, the Tornados targets included three terrorist teams armed with rocket propelled grenades, a sniper position, a Daesh group in close combat with Iraqi troops, and a large group of at least 17 terrorists, who suffered a direct hit in 6 attacks, again with Paveway IVs. By December 25, Iraqi and allied tribal forces had managed to enter the al-Haouz District, and also were about 500 meters away from the main government complex. RAF Tornados maintained close air support over Ramadi, once again working closely with other coalition aircraft, they used Paveway IVs against 2 terrorist teams, an anti-aircraft gun, and a massed Daesh group who were assembling for an attempted counterattack on the successful Iraqi advance. 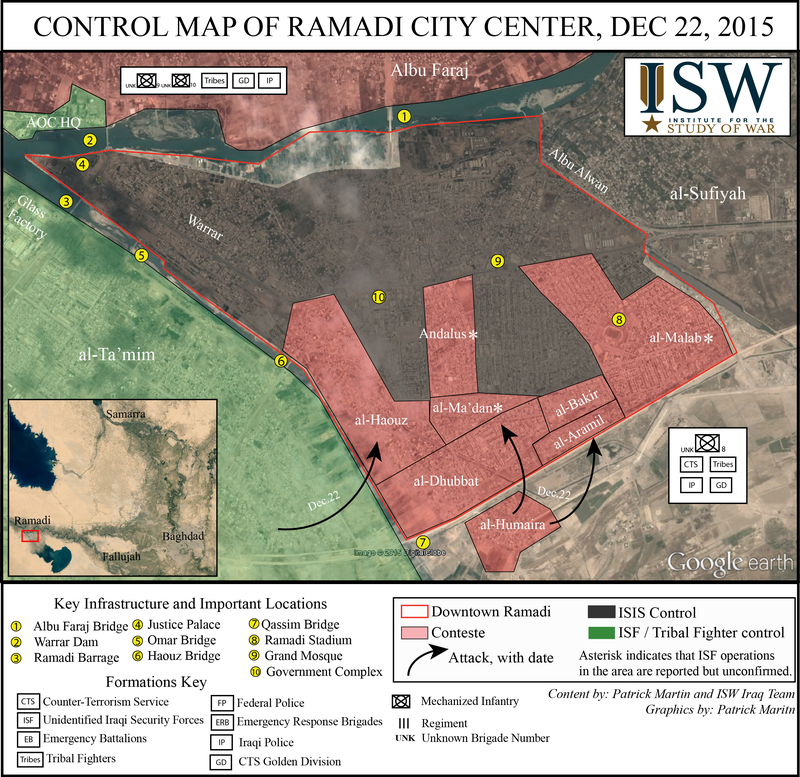 On December 26, Iraqi forces captured the Ramadi Barrage, in northwestern Ramadi city, and evacuated 120 civilian families from the city. On February 27, Anbar Provincial Council announced that 15 members of the Iraqi army and police during the dismantling of improvised explosive devices and booby-trapped houses in Ramadi. ↑ Voices: A heartening victory over the Islamic State. ↑ 140.0 140.1 Is the Islamic State losing its grip on Fallujah? This page was last modified on 26 May 2016, at 15:14.